On Tuesday, January 9, Senator Karen E. Spilka (D-Ashland) will host a forum with the Rennie Center for Education Research and Policy about social-emotional learning (SEL). The conversation will highlight the work of exSEL: Excellence through Social-Emotional Learning, a network bringing together school districts across Massachusetts to design and implement policies and practices that promote SEL. 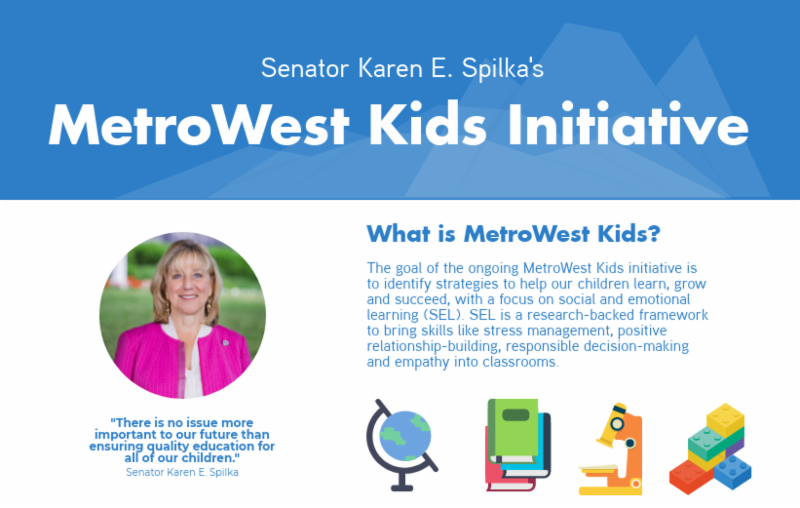 The forum is part of Senator Spilka's MetroWest Kids Initiative, designed to identify strategies to help children in MetroWest learn, grow and succeed, with a focus on social-emotional learning. SEL is a research-backed framework to bring skills like stress management, positive relationship-building, responsible decision-making and empathy into classrooms. January 9, 2018 - 6 p.m. to 7 p.m. NOTE: This event is free and open to the public; attendees must RSVP via Eventbrite. The exSEL Network is led by the exSEL Coalition, whose members include the Massachusetts Association of School Committees, Massachusetts Association of School Superintendents, Massachusetts Organization of Educational Collaboratives and Massachusetts School Administrators Association. The exSEL Coalition's non-profit partners, the Rennie Center and Teachers 21, provide expertise, support and training for the network.